When I came across this scripture initially it made me smile and have a quiet chuckle. It seemed like a possibility for a Monty Python sketch. I pictured a group of people in a conspiratorial huddle. One says “Let us lie in wait for the virtuous man.” Another a bit puzzled asks “Why?” “Because he annoys us,” comes the answer. I then began to wonder if virtuous people are annoying? I could see this being so if the virtue was false. An example being a story by Saki called “The Story-Teller” where the main character, Bertha, was horribly good and had three good conduct medals which prove to be her undoing. I thought “Lord save me from being horribly good”. Yes, false virtue could well be annoying but this is not the virtue mentioned in the scripture. This is true virtue which seems to make others feel under judgement, even if that isn’t the intention, and can provoke a violent response. A simple example is how people who drink can be very disparaging about people who don’t. Let us lie in wait for the virtuous man, since he annoys us and opposes our way of life, reproaches us for our breaches of the law and accuses us of being false to our upbringing. He claims to have knowledge of God, and calls himself a son of the Lord. Before us he stands, a reproof to our way of thinking, the very sight of him weighs our spirits down; his way of life is not like other men’s, the paths he treads are unfamiliar. In his opinion we are counterfeit: he holds aloof from our doings as though from filth; he proclaims the final end of the virtuous as happy and boasts of having God for his father. Let us see if what he says is true,let us observe what kind of end he himself will have. If the virtuous man is God’s son, God will take his part and rescue him from the clutches of his enemies. Let us test him with cruelty and with torture, and thus explore this gentleness of his and put his endurance to the proof. Let us condemn him to a shameful death since he will be looked after – we have his word for it. Powerful and prophetic words indeed, it sounds like the writer is talking about Jesus and the way his enemies treated him. Now I may not regard myself as virtuous and God alone is good, but if you are wondering if you are making progress in the Christian life look at the quality of your jokes and avoid places of ambush. For a meditation have a look at this song “Mansion Builder” by the group 2nd Chapter of Acts (good old youtube). For Jesus who prepares a place for us also prepares us for the place. Following on from the last blog and the scripture “To have seen me is to have seen the Father” John 14; 9, I was wondering about the nature of parenthood. If we see the Fatherhood of God in Jesus can we also see the image of our own parenthood in our children. Plainly yes, as we can also see the parenthood of our parents reflected in us. I often find myself saying something and hearing my mother’s voice. This would not be with the same perfection as we see in the trinity, often far from it, but it perhaps shows us something of the mystery of God’s parenthood as we are made in His image and therefore can image something of Him. In discussions on family life this scripture is often quoted; “Children be obedient to your parents, because that is what will please the Lord.” Colossians 3; 20. 3.“Found” – But after studying the catechism/scripture I found that Jesus’ teaching on that subject makes perfect sense. As a parent with a teenager that may mean saying ” I love you and it is in your best interest that I say “No”. Still not easy but perhaps a more compassionate and reasoned response. 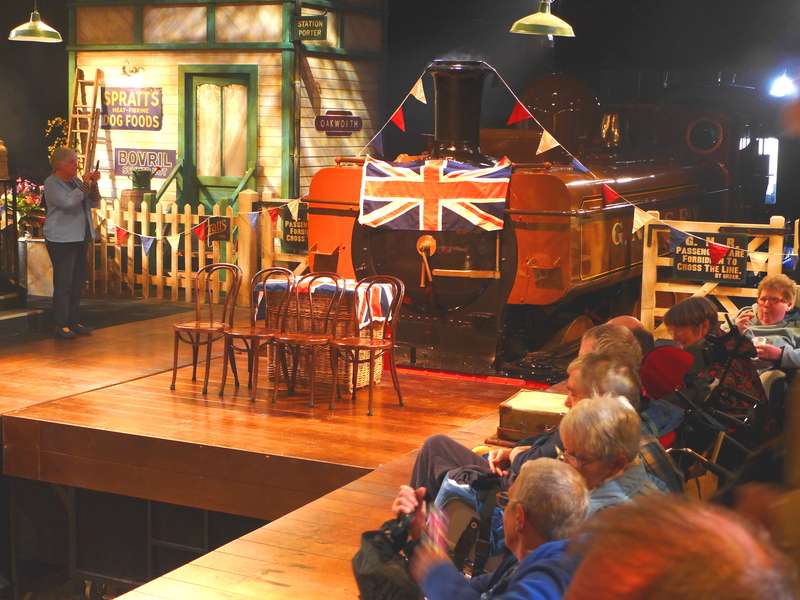 Photograph taken during the interval of “The Railway Children” at the Railway museum, York. It is just the meeting on the station which is relevant to this blog rather thanthe whole clip. This set me thinking about the Fatherhood of God and how we should see Him as someone we would want to run to and be embraced by. An image of god we’d be more likely to run from. From the Gospels, particularly John’s, we get an even clearer picture of the Fatherhood of God and that the nature of that Fatherhood is shown in Jesus. We have that most famous verse of John 3; 16. For God so loved the world that He gave His only Son, so that everyone who believes in Him may not perish but may have eternal life.” and in John 14: 9 where Jesus says “Whoever has me has seen the Father.” and that great assurance of John 20: 17 where Jesus says to Mary Magdalene I am ascending to my Father and your Father. I am aware that not everyone has had a good experience of Fatherhood, my own father was largely absent from my life, and some of those experiences are absolutely dreadful. In modern terms I could say if that was the case then “You was robbed!” and what you didn’t have from your earthly father you can more than have in your Heavenly Father. In Psalm 68: 5 God is described as “A Father to the fatherless.” The one who undoes what was damaged and makes new what was broken. So what does this “go in and out” mean? If we were thinking of Jesus as the door to heaven we would just be “in” as our eternal destiny. So where might we be going to a place of blessing through Jesus Christ and coming away again? The Church and in particular the Catholic Mass which is meant to be in union/communion with the Church in heaven as glimpsed through the lens of John’s revelation. Those things we see in the Church and the mass such as candles/torches/lampstands, incense, vestments, worship, forms of words, are all there in John’s revelation (as well as all the end-times stuff which is so fascinating). So what we are participating in is an image or reflection of the Church in heaven. If we then by a leap of imagination put ourselves on heaven’s side of this lens we are then looking from the Church in heaven to the Church on earth. Wow!!! That should enable us to go to Church with a certain sense of excitement, anticipation and awareness that we are going to a place of worship, that right relation between creature and Creator, and blessing. A taste of heaven on earth. What better place could we be. We come to the Father,through the Son,and in the Spirit – we offer our worship and we receive blessing, and this for a purpose – for our going out back into the world. The Lord’s day then becomes the beginning of the week when we are equipped and empowered for the task ahead rather than the end of the week and our being refilled because we are run down. As a reminder make sure you have a calendar that starts the week on Sunday rather than one that ends the week on Sunday. Perhaps we can then see Sunday Mass as a mountain top experience (Matthew 17; 1-8) where we behold his glory, worship and receive blessing, and then go down the mountain for there is much to do.